Diane Mott Davidson is the New York Times bestselling author of seventeen mysteries featuring caterer/sleuth Goldy Schulz, each of which includes recipes for scrumptious dishes from the adored character’s kitchen. Due to popular demand, Davidson has collected these treasured recipes and some brand-new dishes in one volume (more than 160 recipes in total), Goldy’s Kitchen Cookbook and it’s on sale September 22! Get a taste from Goldy’s kitchen for free until August 31st. And don’t forget to pre-order your signed first edition of Goldy’s Kitchen Cookbook for the full recipe collection. 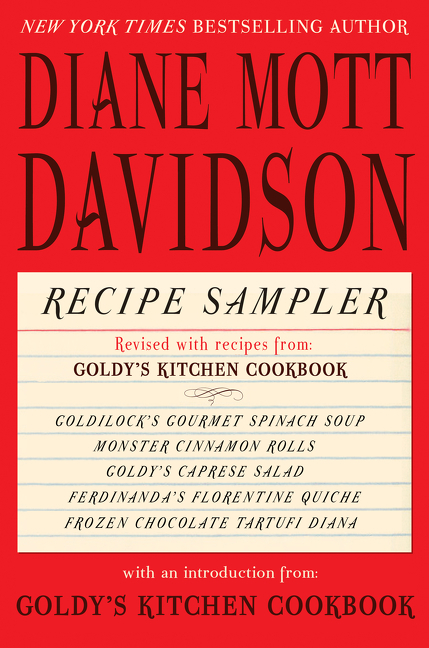 Download the free Diane Mott Davidson Recipe Sampler from your favorite retailer.